Kevin Nicholson is PwC UK’s head of tax, and worked as an HM Revenue and Customs tax inspector in the early 1990s. 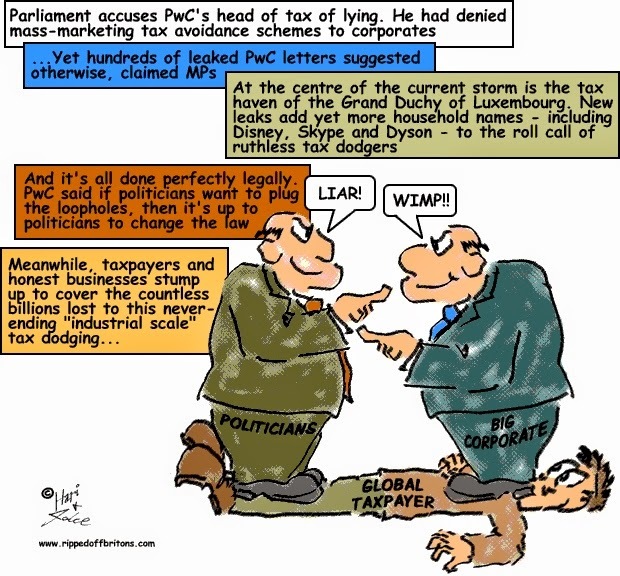 In January 2014 Nicholson told parliament’s Public Accounts Committee that PwC did not “mass market” tax products or sell tax avoidance “schemes” to clients. But in November this year, new evidence revealed that PwC wrote hundreds of letters - 548 letters relating to 343 companies –to Luxembourg tax authorities to agree on how their clients structured their businesses for tax purposes. “It’s very hard for me to understand that this is anything other than a mass-marketed tax avoidance scheme,” said the committee’s chair, the Labour MP Margaret Hodge. “I think there are three ways in which you lied and I think what you are doing is selling tax avoidance on an industrial scale.” Nicholson denied lying to parliament, and added: “At the heart of the Luxembourg economy now is an economy that is based around businesses going there to finance [and] to hold investments… I’m not here to change the Lux tax regime. If you want to change the Lux tax regime, the politicians could change the Lux tax regime.” Last month’s analyses of the way multinational companies establish businesses in Luxembourg were based on a leaked cache of hundreds of tax rulings secured by PwC Luxembourg that showed major companies – including drugs group Shire Pharmaceuticals and vacuum cleaner firm Dyson – using complex webs of internal loans and interest payments, which have greatly reduced tax bills. Jean-Claude Juncker, president of the European commission, has been battling to distance himself from the growing furore over the Grand Duchy’s role in facilitating “industrial scale” tax avoidance. Among the new companies exposed in the secret tax documents are Disney, FTSE 100 firm Reckitt Benckiser, the Skype internet-phone arm of Microsoft and the Koch brothers. The Koch empire is the second largest privately-owned business in the US and is controlled by siblings who fund rightwing political campaigns. Juncker has sought to brush aside suggestions the Grand Duchy, under his leadership when he was prime minister, undermined the tax receipts of other nations by enabling large-scale tax avoidance by multinationals. The latest revelations show that about 340 companies – including Fedex, Pepsi, Shire Pharmaceuticals, Icap and Ikea – had secured tax deals with Luxembourg with the assistance of accounting firm PricewaterhouseCoopers (PwC). The creation of aggressive tax structures is not limited to PwC alone. The new papers include similar deals secured for big clients by the remaining members of the big four group of accounting firms – EY, Deloitte and KPMG. Last week, the finance ministers of Germany, France and Italy demanded a clampdown on Luxembourg-based tax avoidance in a letter to the EC’s commissioner for economic affairs, Pierre Moscovici.